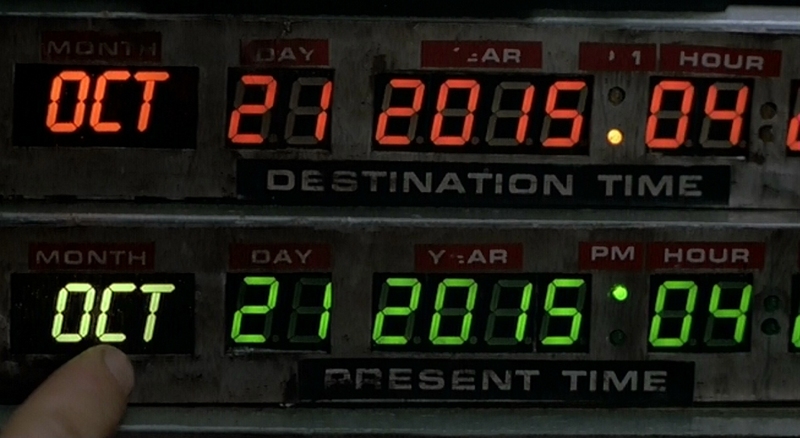 Today is “Marty McFly Day” or, alternatively, “Back to the Future Day”. 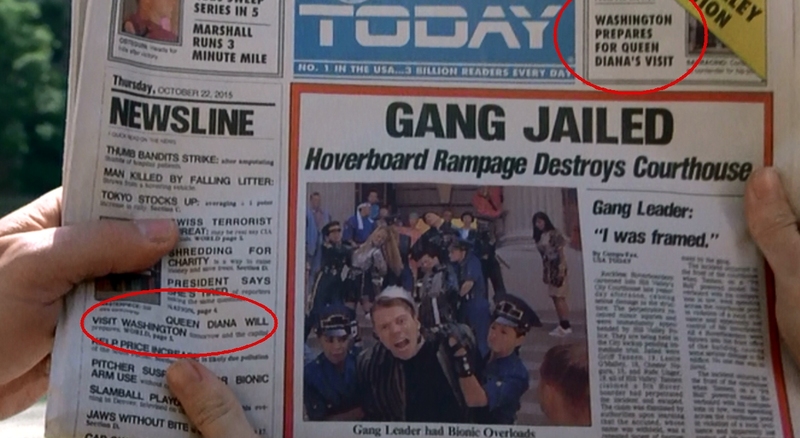 Today is the day in the future that Marty McFly arrived on 30 years ago. Over the last few years there have been numerous waves of idiotic memes or gullible Facebook posts which proclaimed that “today” was the day, or that we had just missed it, or similar such stupidity. They were all wrong. It is Wednesday, October 21, 2015 when Doc Emmett Brown, along with Marty McFly and girlfriend Jennifer, flies in with a DeLorean from the year 1985. At 4:29 PM, to be precise. Today is the day when Doc and Marty will encounter hoverboards, flying cars, video conferencing, food hydrators, news drones, fingerprint readers, voice-controlled home automation and mosaic-view multi-channel large-screen flat-panel TV sets, motion controlled arcade games, power laces, augmented reality visors, holographic 3D movies, and a black Michael Jackson giving cooking advice — Max Headroom-style. In fact, the future present looks like something straight out of the Jetsons! One need not be a child of the 80’s to appreciate the Back to the Future trilogy; the movies are about as all-American as it gets, with enough intelligence, alternate timelines and disrupted continuums to delight any nostalgic middle-aged geek’s Sci-Fi heart. What they will not encounter is today’s modern computer technology or an internet that is accessed via mobile multi-purpose communication devices known as smartphones. Amazingly, the recent advances in telecommunications/IT are the one thing that the majority of future-themed movies or books have completely underestimated. The fax and the newspaper are supposedly still in heavy usage in the year 2015. In the audience’s timeline, laces don’t tie themselves yet. Cars don’t fly, boards don’t hover, and drones shoot innocent bystanders collateral damage instead of the news. There is nothing wrong with the Earth’s gravitational pull in 2015. Instead, we have climate change — which is just as heavy. As for “Queen Diana”? Well, we all know how that turned out. Lawyers have not yet been abolished, and we’re nowhere near Jaws 19 yet. Instead, we had to contend with Sharknado. Still, there are a few predictions that the movies did get right — sorta. I won’t describe them in detail like the spate of recent other articles and tumblrs because you are, indisputably, reading this in the past’s future. Which is the present. Today. You know what technology is available in 2015 as much as you should know that we’ll have to wait until November 2019 for flying cars — if Blade Runner is anything to go by. And the sharks still look fake. This entry was posted in Movies and tagged 2015, futurism, internet culture, science fiction, time travel. Bookmark the permalink.